Starred ReviewBursts of exuberant music add zest to this beautifully produced audio presentation of Troy “Trombone Shorty” Andrews’ award-winning picture-book autobiography about how the celebrated contemporary musician discovered a love for playing music. With his rich evocative voice, narrator Graham expertly reads Andrews’ heartfelt words about loving the music he grew up hearing in New Orleans’ Tremé neighborhood and how he wants to keep that musical heritage alive with his own compositions. The program’s many vibrant sound effects offer snippets of brass bands playing for Mardi Gras, people humming, and even a comical moment when a bunch of kids imitate tooting instruments with their mouths. When young Andrews plays his very first instrument, a beaten-up trombone, it sounds convincingly ragged. An especially well-done sequence has six-year-old Andrews joining Bo Diddley at the New Orleans Jazz & Heritage Festival. The sound mixing is perfect, re-creating the moment Diddley (voiced by Graham) speaks through a microphone to a cheering crowd, inviting the boy up to the stage. For maximum impact, listeners should have a copy of the book on hand to appreciate Bryan Collier’s stunning illustrations. One track has narration with page-turn signals, the next without, and the third track has Graham reading the author’s and illustrator’s notes. This first-rate title belongs in every audio collection. 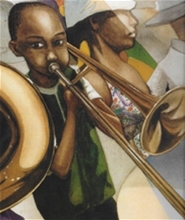 Music featuring a single trombone precedes Dion Graham's narration of this picture-book autobiography by "Trombone Shorty" Andrews, a New Orleans native and Grammy Award-nominated musician. Then, the first words of the audiobook—"Where y'at? "—greet listeners with an energetic New Orleans welcome. Graham draws listeners of all ages into an experience that's lyrical in word, illustration, and music. His dynamic reading blends with Andrews's words and music to dramatize everything from Shorty's weak initial efforts on the trombone to the crowds who roar with pleasure as he shares the stage with Bo Diddley. Andrews refers to creating "a musical gumbo," and the metaphor represents this audiobook perfectly. There is the richness, variety, and spice of this New Orleans dish in Bryan Collier's mixed-media illustrations, the vocal range of Graham's reading, and the lively music and animated soundscape.